Thanksgiving is only a few days away and in addition to the Thursday feast with the traditional turkey (or deep fried turkey) that most people will be partaking in this week, we often have potlucks at work as a pre-Thanksgiving ritual to bring out the festivities at the work place. As with most office potlucks, we seem to see a surplus of salads (fruit salad, green salad, pasta salad, potato salad) and desserts (cakes, pies). Why? Because salads are easy to make and desserts are easy to pick up. Now I wanted to bring a decent side dish that people would enjoy and would let everyone know that it's Thanksgiving, so I turn to a common Thanksgiving staple: sweet potatoes. Most Thanksgiving meals are characterized with the turkey (of course) and other common Thanksgiving items such as stuffing, gravy, ham, cranberry sauce, and pumpkin pie a la mode. Out of all the Thanksgiving dishes that we have, I always go to the dish that one of my sisters always brings to the party: sweet potato casserole or what I refer to as mashed sweet potatoes. This by far is my favorite Thanksgiving dish and I always look forward to it, and my sister gave me the recipe so that I can make it for my office potluck. It's sweet flavor profile makes me think that I'm eating dessert with my turkey. It definitely is a stark contrast from the savory flavor of regular mashed potatoes. The first question which you may ask in regards to this dish is: What's the difference between sweet potatoes and yams? Now I'm not really sure and for you readers who may know, correct me if I'm wrong. 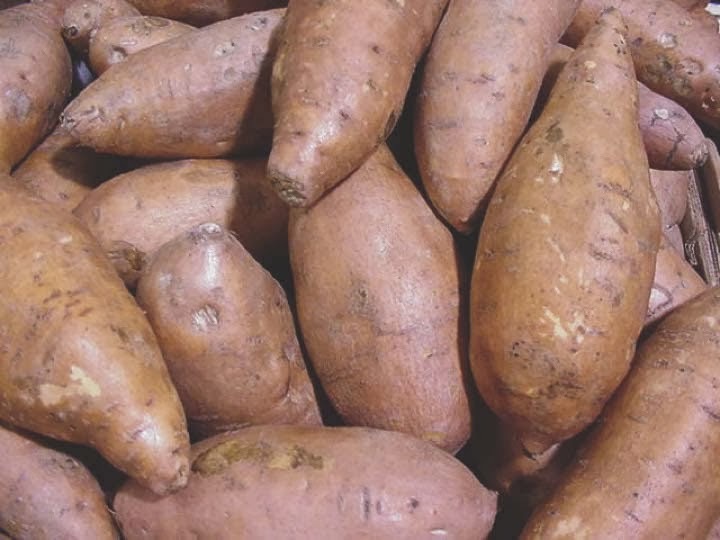 As far as I know and for all intents and purposes, yams are bright orange whereas sweet potatoes are ligher and almost white in color. I know I know...both terms are often used interchangeably (for example sweet potato fries which tend to use the orange variety). For this recipe, you could use either the white (sweet potatoes) or orange (yams), but I prefer to use the white variety because it's a bit healthier than the orange. Luckily, my local grocery store only carries 3 kinds: the white, orange, and purple. Whatever you use, do not use the purple one. 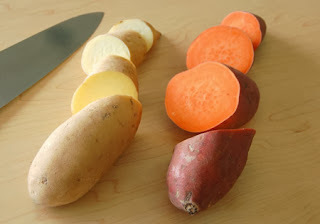 Sweet potato with its white inside (left) and yams with its orange inside (right). The pecan topping gives this dish a slight crunch in contrast to the smooth texture of the mashed sweet potatoes and the sugar added to the potatoes obviously sweetens this dish. My favorite ingredient though is the vanilla. For some reason it's the vanilla that makes this dish great. I've had other mashed sweet potatoes and they've all been just ok...nothing great, but the vanilla gives this dish a certain depth of flavor that complements the sweet potatoes, pecans, and sugar. Sweet Potato casserole before adding the pecan topping. This recipe is enough to fill an 8x8 or 9x9 inch square 2 quart casserole dish. 3 cups of mashed sweet potatoes doesn't seem like a whole lot, but it definitely can fill an 8x8 pyrex dish 1 inch deep. This is what I'm going to use for my work potlocuk since there'll be other dishes people will be bringing and a square casserole dish can fit in the microwave for reheating. For bigger family events, I double the recipe and use a rectangular casserole dish. 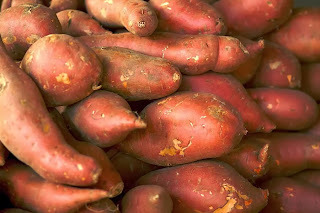 Buying 2 medium to large sweet pototoes will equate to roughly 3 cups of mashed sweet potatoes. I used brown sugar instead of white sugar in the mashed sweet potatoes because white sugar made it too sweet. If it's still too sweet for your palate, cut the sugar to 1/2 cup. The sweet potatoes already have a certain sweetness to them so you don't want to over sweeten them. For the topping, the only thing I used was the pecans. I left out the sugar, butter, and flour because I didn't want to make it more complicated than it had to be and I wanted the sweet potatoes to be the hero of the dish and not the topping. In this case simpler is better. You can take the time to chop the pecans or you can do what I did which was put the pecans in a sandwich bag and hammer it with a meat tenderizer. There might be a few pecan pieces that are still too big so you may need to take care of those individually. You can use a food processor to chop up the pecans, but I absolutely hate cleaning the food processor. Cutting into the mashed sweet potatoes reveals the 2 layers. 1. Preheat oven for 350°. Peel yams and cut each into 8 equally sized pieces and boil yams and drain well. You will know when they are done when the sweet potato pieces are soft and you can easily stick a knife or fork in them with little effort. 2. Combine yams or sweet potatoes, sugar, eggs, milk, vanilla and butter. Beat with electric mixer until smooth. [I mashed up the sweet potatoes before adding them to the mixer and allowed the mixer to integrate the rest of the ingredients]. Spoon into a 2-quart casserole. 4. Bake for 30 minutes. Serve warm.